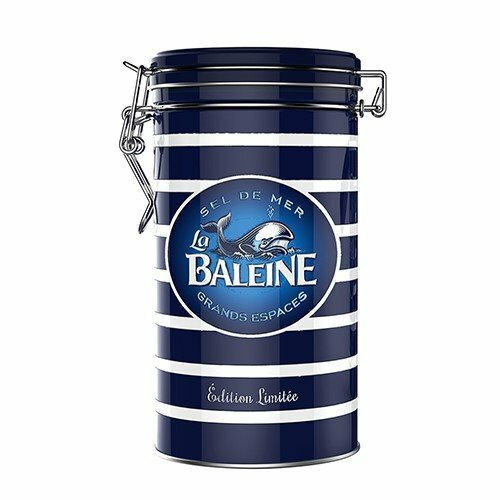 Always have the finest coarse sea salt at hand with this limited edition La Baleine Salt Tin. Coarse salt, harvested on salt tables, is naturally white and its large size crystals are of a unique purity. La Baleine salts are from the Mediterranean salt marshes. Its bold blue and white stripes and retro styling make this nautical-inspired tin the perfect counter-top conversation piece, and the clamp lid keeps the salt free of excess moisture and contaminants. If you have any questions about this product by La Baleine, contact us by completing and submitting the form below. If you are looking for a specif part number, please include it with your message.